After years, I'm officially on the road! The fate of THIS blog is still up in the air, but just in case anyone is actually still reading it..
A quick update is in order, I suppose. I plan to change this blog eventually, I think. Or possibly get rid of it until I'm ready to actively update it. BUT, for now. I've been "living in" the motorhome since April. I sleep out there every night and my cats are out there too. But I'm still just at my parents so I use the shower and whatnot in the house. For Memorial Day I went up north to hang out with an ex-coworker of mine and met a bunch of people up there. It was a good time and a good trip for the motorhome! Shortly after that I headed back up to that general area and hung out in the national forest for 2 weeks before heading back home for birthdays and whatnot. I've been at home since. While here, I replaced all the brakes on the motorhome and that's partly why I haven't driven it since. I'm just nervous about it, since I had to deal with bearings and taking entire hubs off and whatnot. The rear brakes were too tight originally. I've backed them off now, even though it was a pain to do it.. I hope I didn't wreck anything inside during that. I haven't driven it since I backed the rear brakes off. I need to take it for a drive soon and make sure the brakes and everything are good because I'm heading back up to the same area with the same people on Labor Day, but I won't be able to stay as long because I have to be back on Saturday for a family event. I've got new rear tires and new 16" rims to put on the rear so I can get rid of the odd 16.5" size. I just did that yesterday so they're not on the motorhome yet. 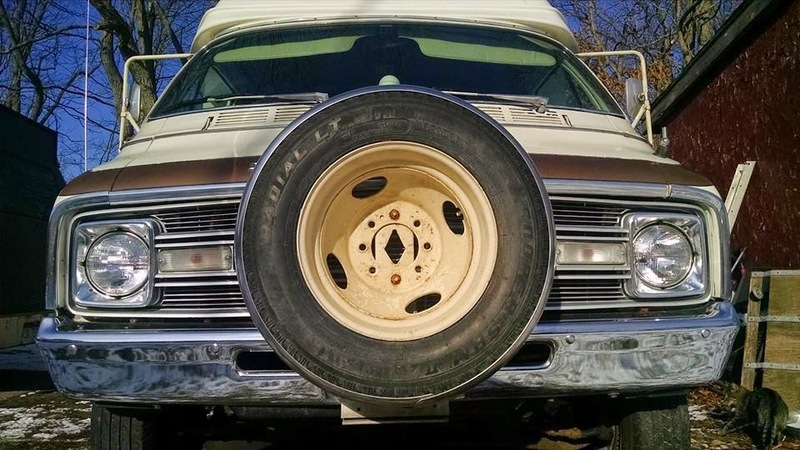 Looking for some tires to put on the front of the van so that I can use the tires on there right now on the front of the motorhome. My current plan is to junk out the van when the time comes. I'm planning on finally setting sail after Labor Day. At long last! Things are finally lining up in a way that I feel comfortable about. My only plans as of right now are to hit Elkhart, IN to see the RV museum, and then Mammoth Caves National Park. Just kind of a general direction. I'm only thinking 25-30 miles a day. So it'll be a leisurely journey, but I don't consider this a vacation. It's a way of life. Slower travel means making the money stretch. There's an update for now. I'm excited for after Labor Day. I don't have a specific day or anything. And now I'm waiting for a new vanity license plate to come in "2-3 weeks", which still should be before Labor Day. Adventures to come! First trip went great. 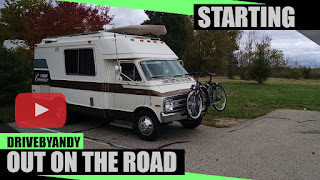 Things not in the video include using the toilet for the first time, dumping my tanks for the first time, showering every day in the rv. Showering was a little weird because my water started to smell like garlic. I didn't get a rash or anything, but still kind of creeps me out. I'm going to put some bleach in the freshwater tank soon and try to sanitize it before the next trip. I came back for Mother's Day and the township is having another spring clean up this week so I can get rid of some more stuff for free. All has been quiet around these parts, but the world still moves forward. YouTube videos have been non-existent, as they will continue to be until after I'm actually on the road. 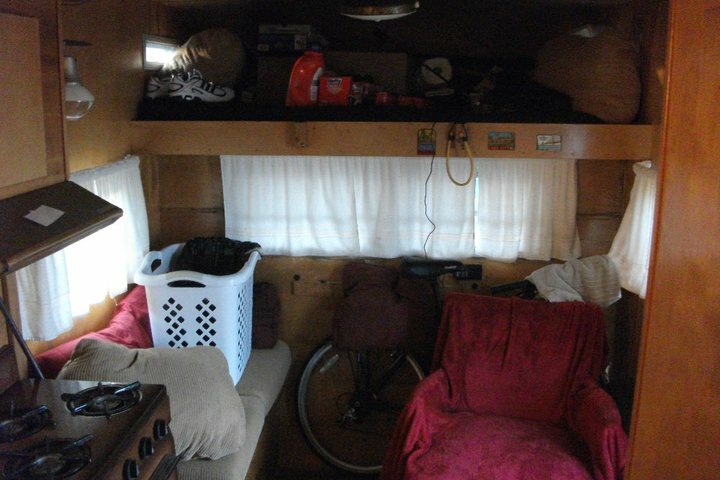 Everything from the trailer was moved into the motorhome and made it a mess. I've been slowly dealing with that, but the massive clutter really caused me to drag my feet. Most of it has now been shoved into corners of the RV to be dealt with later on down the road. I'm going to start moving the 'every day' things from my room in there soon. So things are getting close. 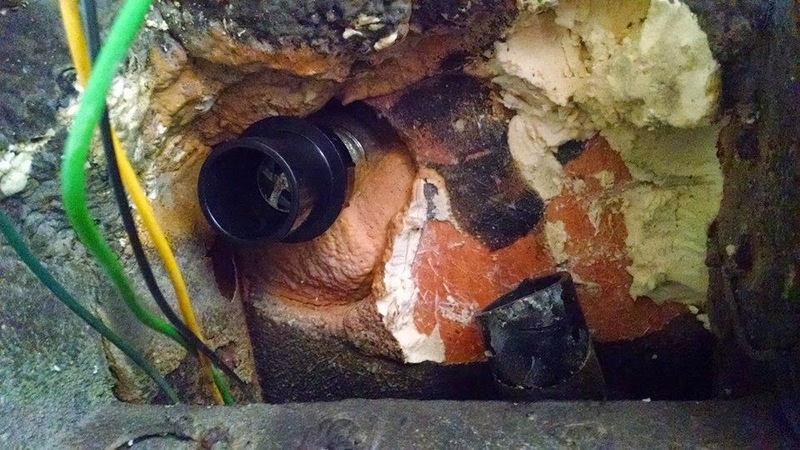 I guess I never mentioned it here, but the p-trap for the shower drain had a massive crack in it. Don't know if I just never noticed until recently. I've never really used the shower yet. Fixing that ended up being a hell of a project. Tracking down the right parts, trying to find parts for a sub-par fix.. and then in the end just doing it more-or-less "right". All through the holidays too so the RV shops kept being closed. 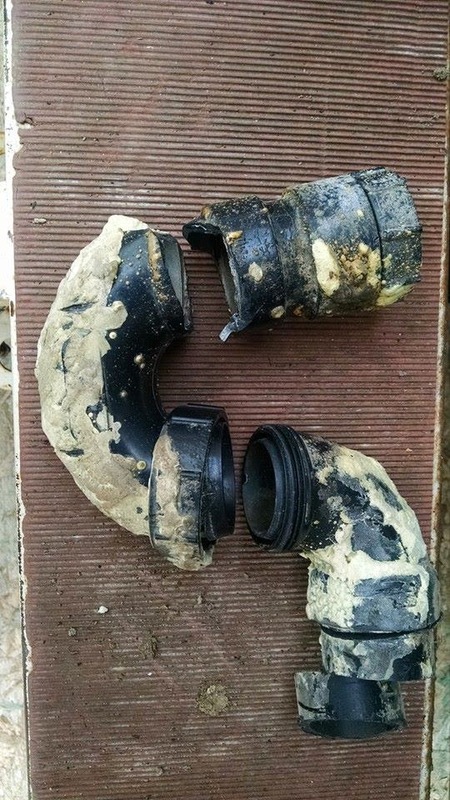 I couldn't find the black ABS pipe anywhere but the RV shops. As far as I know I fixed the problem, but I haven't tried running any liquid through it yet. I also noticed the pipe that goes from the grey water tank to the dump valve has a hair line crack. I'm not going to fix it before I leave. 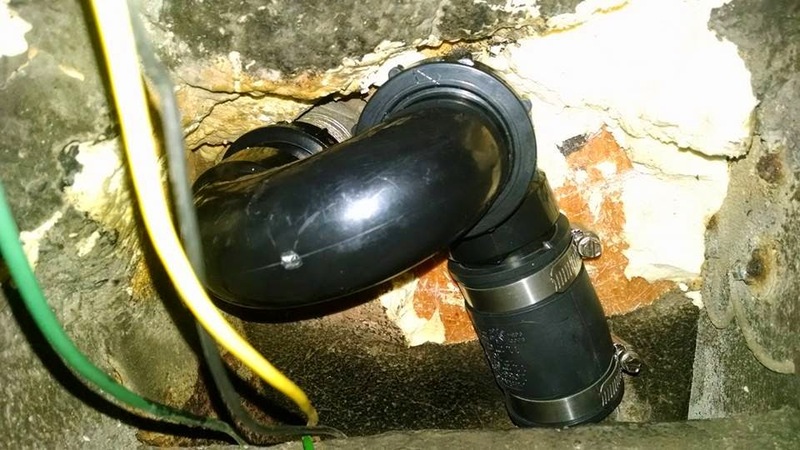 Hopefully it won't leak too quickly. 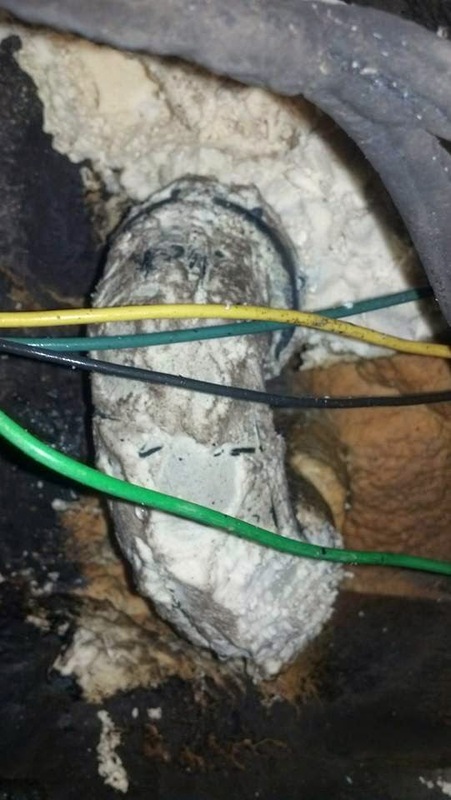 It's too cold for the pipe cement now anyway. My attention has also been on the entry door lock. It was fickle and only worked when it wanted to. I took it apart, lubed things up, and tried to fix it. In the process of trying to lock it from the outside, the lock cylinder broke off completely. I replaced it with a "RV Designer" (trimark) T507. I needed to use a Dremel to cut away some of the door frame (and door) to accommodate the dead bolt. The T505 model doesn't have a dead bolt, and would have been easier, but I kind of wanted one. 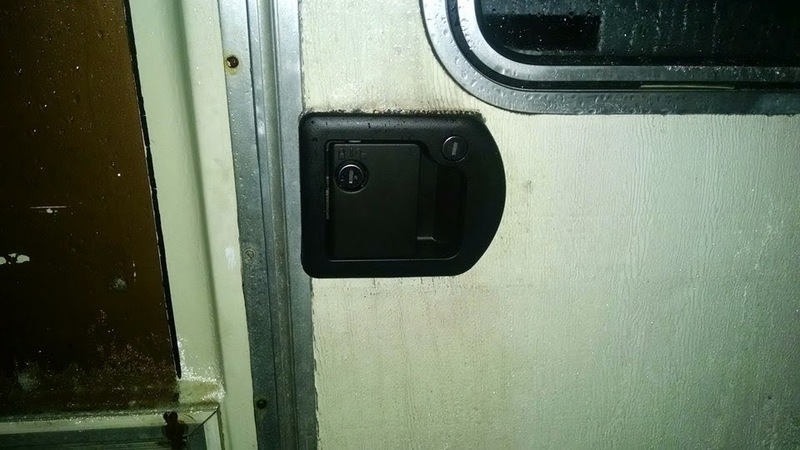 It was dark and rainy so I still need to make a few minor adjustments on this but the door closes and locks just as it is, which is more than I could say for the old Bargman L300 lock that used to be on there. Another fun thing I did a while back that I never mentioned. I haven't had a rearview mirror since I bought the thing. I never really cared. 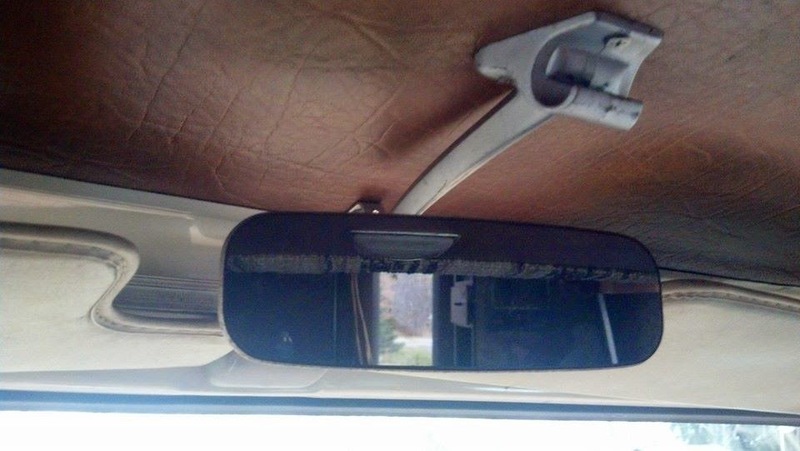 But I've had this mirror from my first car (66 Falcon) rolling around for a while so I decided to put it in the RV. I like it. Tongue in cheek.. I'm thinking a week or two I'm going to be taking off. Meaning YouTube would be resuming in two or three. My videos are going to be running a delay purposefully. 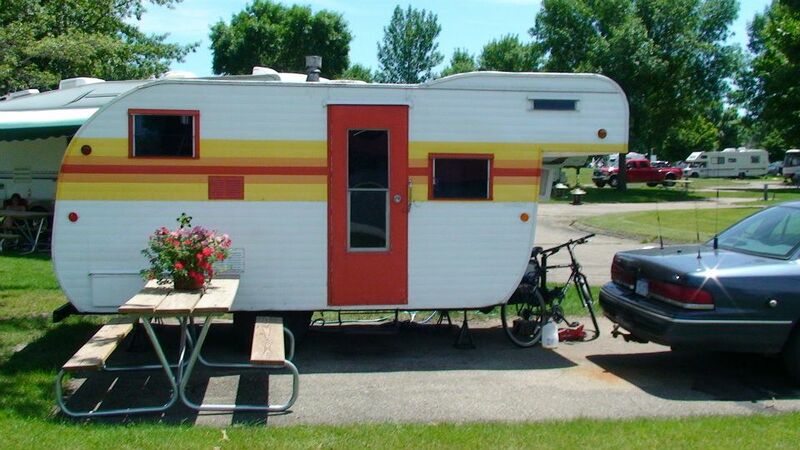 My beloved travel trailer has entered the realm of pictures and memories tonight. The above pictures are a combination of Kansas and Iowa, years ago. It was in much the same shape, but with a much dirtier exterior when I sold it tonight. I listed it for $650 on Thursday. A really amazing price for what it was. But I was aiming for a quick sale and it's December. Not an ideal time to be selling these things. I wanted to get it out of the yard before any snow came back. It has all melted for the time being. Had a lot of out-of-state interest, but I didn't want to mess with that. I showed it to two groups yesterday. The first group I didn't think I'd hear from again. The second group pretty much said they'd buy it, but needed to see if they could borrow someone's truck to tow it home. They backed out hours later. Surprisingly the first group emailed back last night asking for some measurements and came to look at it again this morning. Again, left and said they'd call me later. They actually did though, and hauled it out this evening! Pretty happy, really. Now I can shift focus back to the motorhome. Figuring out what can stay inside of it, and what needs to go. I am officially a week ahead of schedule on the sale of the trailer. I was going to sell it by the 14th, no matter what. If you've learned anything from my writing, I hope you know that I am fickle, and change my mind often. The snow is finally coming. 15 miles away from me got 10 inches the other day, while we got just a dusting. Tonight my area is looking at 3-10" it sounds like. Right on the line between 3-6" and 6-10". Anyway, I allotted myself $2500 to get a different vehicle. Even took it out of the bank and was ready to take the plunge. I looked at one minivan and of course it wasn't quite as described. I continued my search, had a couple leads.. But then I started to ask myself what I was doing. I still don't know what I'm doing, and the snow that arrives tonight complicates things a little more. I've been working on trying to find places for things in the motorhome. At the same time I've been trying to get my mind right enough to make the final push to get rid of things. Everything that used to be in my storage now fits in my old travel trailer. Which is amazing, and I need to recognize that. At one time I had reached a point where I was 'okay' with leaving it just at that. 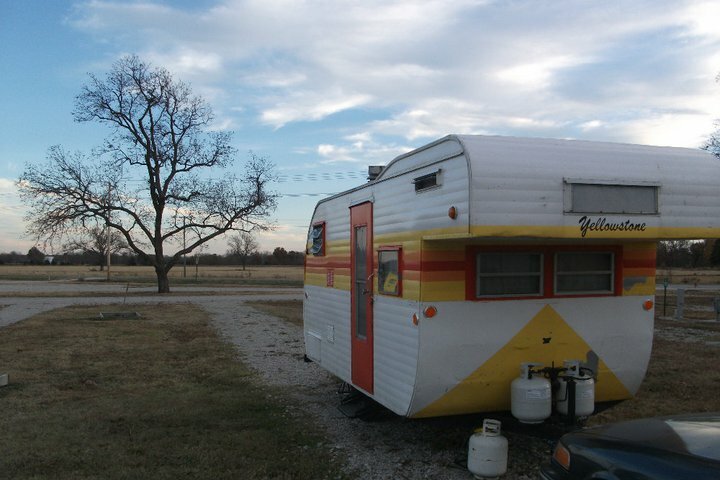 The trailer would be parked here at my parents and I could travel and feel 'okay' about it. Not so much anymore. I really want to get rid of everything left in there and then sell the trailer for cheap to get rid of it. That trailer is going to be stuck in the snow pretty soon, and nobody is going to want to mess with it. So am I hitting the road? Answer still unknown. I'm leaving the option open. Another realization I've made is that if I don't trust it enough to travel in, after ALL of the time and money I've put into it.. then why do I have it? At this point there's nothing that's going to make it better. I've already put a new engine in it. Eventually I just have to take that leap of faith. I would say that currently I'm leaning towards hitting the road. I feel like a bit of a failure once again. For how long I've had this blog going and making videos for YouTube it seems like I would have gotten my crap together and been on the road at this point. To be honest I'm incredibly close. There's really no reason I couldn't be on the road this winter. 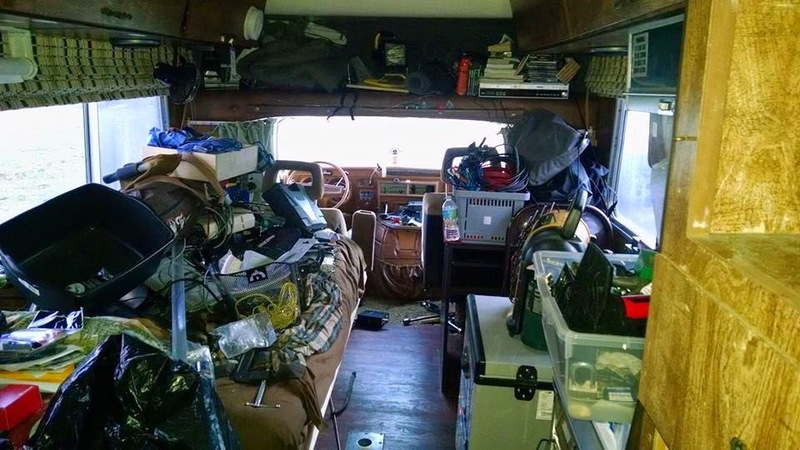 There are a handful of things I would feel a lot more comfortable doing/fixing before I hit the road, but I could squeeze by without addressing them. Mostly I'm just not 'feeling' it. I feel like I'd be forced into doing something I'm not 100% ready for just because winter is coming and the evil white stuff (snow) will be making all of my decisions for me. I'm concerned about money, about breaking down, or about getting out there and after a couple weeks wondering what the hell I'm doing. I've been feeling a different direction lately. I've been feeling really good, and more like 'me' than I have in probably the last 8 years. 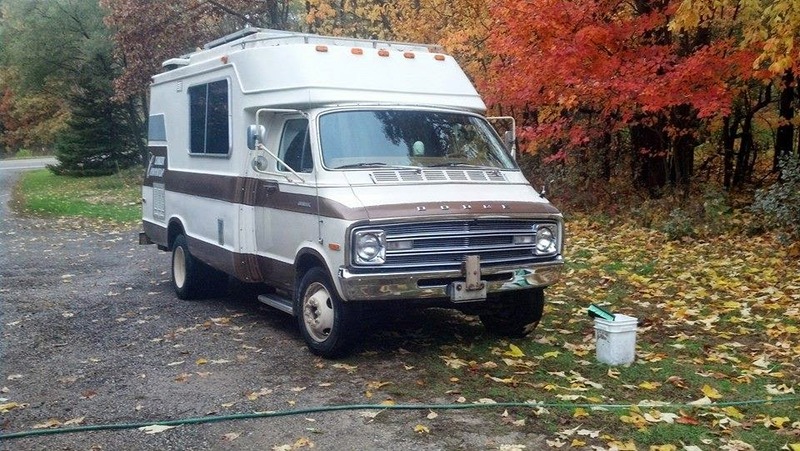 I have no intention of getting rid of the motorhome, but it'll most likely be sitting through another winter. My life, while there is still work to be done, is more organized than it has been for years. I'm finally down to two vehicles, the motorhome and my van. Junked out my other old vehicle a few weeks ago. My storage unit is gone, but I'm still dealing with some of that stuff.. at least I'm not paying $100/month anymore. I've been working on web development lately, which is what I used to do. Things more or less seem to be falling into place in the big picture again. I'm seriously considering getting rid of my big 1 ton van. Practically every system on it needs repair in one way or another, and it will be terrifying driving it this winter. I'm looking at minivans, because I still like the space. It'd be nice to have something with a lot less rust and a little better gas mileage. This change is probably going to force me into getting a job again. I'm not opposed to it. I'd be looking for part time though, or else 3 possibly 4 day work weeks. I want to have time to do something with my life, and also to keep focusing on the web development stuff so hopefully I can get back into my own independent income stream enough to support my life. At this point I envision having a minivan for short trips this winter, and then getting out and about more often in the motorhome next year after the snow melts. So.. anyway. The above picture is from washing the motorhome. The roof still needed to be cleaned at the time of the picture, but I washed it on Monday. I'm also putting the bars across the top back on because my roof seems to be sagging. Unfortunately I'm cutting down the sides that go under the solar panels and it's weakening them quite a bit. Better than nothing, is my mindset. This is also requiring me to take the solar panels off, just to put them back on again. I've done the front bar, I still need to do the rear bar. I also put the spare tire back on the front now that I'm done doing all my engine work. I might try to do the rear without taking the panel off, but it's a good idea to clean under there anyway.